Early foul trouble sent Eli Brooks to the bench early, and the Rockets' season ended in the first round of states. Midway through the opening quarter of Spring Grove's state basketball tournament opening-round game against Spring-Ford, Rockets junior Eli Brooks went sprawling onto the hardwood at West York High School. A referee's whistle sounded. It was not good news. Brooks was called for his second personal foul and spent about a quarter on the bench. What was a two-point game when Brooks sat down turned into a 16-point deficit by the time he returned. The 6-foot-1 Brooks spent the entire game battling foul trouble, and the Rockets couldn't muster anything offensively without their floor general as Spring-Ford led from start to finish in Saturday's 74-43 win in the first round of the PIAA Class AAAA tournament. The loss was the first of the season by Spring Grove to anybody other than YAIAA Division I rival Central York. "We know we have to get off to a good start," said Spring Grove coach James Brooks. "Eli is our catalyst to move the ball around. If he's not scoring, he's assisting. With that early foul trouble, it just threw the mechanics of what we were trying to do off." Spring Grove (25-4) saw Spring-Ford score the first six points of the game before closing the gap on an offensive rebound basket and a fast-break layup off a turnover, both by Brooks. Then came the whistle and Brooks to the bench. "Guys (on the Spring Grove team) aren't used to seeing that," James Brooks said. "So they are back on their heels about what they are doing. It was definitely not the start we wanted." Outside of the two buckets by Brooks, Spring Grove went 2-of-12 from the field in the opening quarter and 4-of-11 in the second quarter. With Brooks back in for the end of the second quarter, the District 3 third-place Rockets trimmed Spring-Ford's halftime lead to 14, but Brooks picked up his third foul in the process. Spring-Ford (21-7), the fifth-place team out of District 1, then went on a 11-2 run in the first half of the third quarter to forge a 23-point lead. The Rams led by 20 by the end of the quarter and were up as much as 31 points in the final eight minutes. Brooks picked up his fourth foul during the third quarter and fouled out with 4:21 to play. 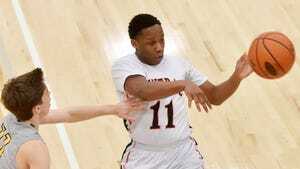 He finished with a team-high 13 points, well below his YAIAA-leading season average of 25.1 points per game. Senior guard Darin Gordon matched Brooks with 13 for the Rockets, who were making their first PIAA tournament appearance since the program began 93 years ago. "You see no tears in my eyes, no shaky voice," James Brooks said. "I get what we did. I get that this was a special year with a special group of kids. I told the kids that no matter how this game turned out, it doesn't detract from what they were able to accomplish this year." 3-point goals — Spring-Ford 9 (Drummond, Cook 3, Fitzpatrick 2, Scarcelle, Gnais, Reid), Spring Grove 2 (Wierman, Brooks).